Walking into the dimly lit and narrow runway, fog crept up and around the legs of the crowd. A startling child’s voice with a horror-like melody alerted those around and a ghost-like garment took the runway. A torn gauzy fabric draped over white undergarments began the show and floated along walkway. As the child-like voice faded out and a nightclub beat shook the runway, models in unexpected neons, fitted androgynous two pieces, and angular silhouettes stomped the floor. Models covered in white paint and dark shadows to convey a very AHS, villainous appearance gave the show a dark and demented feel. Cut up denim cover ups, glittered boot-cut pants, and a low waist mini skirt with only a jacket for the top took a very defiant stance. A almost, washed-up 90’s pop-star vibe in neon pink and black pointed stilettos strutted in and out the room. Pieces inspired by the devil captured many eyes as circus music tinkered through and out their ears. A sea of mohawks, tousled hair, long locks, and smudged makeup disrupted any lick of elegance. 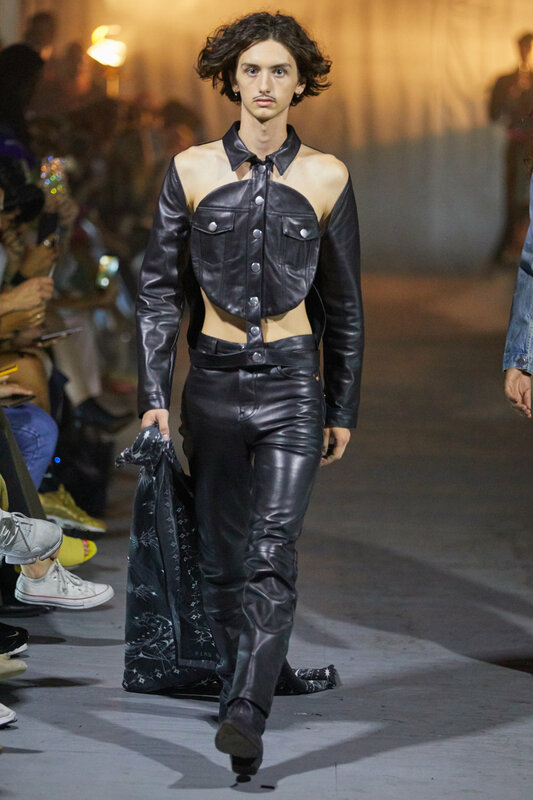 With the music, styling and garments combined, LRS SS19 transformed a long hallway in the middle of chaotic Chinatown into a underground 90’s street kid club scene. A retired DIY halloween costume took the runway as the walking ghostly cut out tee-shirt layered over a neon orange dress held a graffitied skateboard, ready to take the streets. Raul Solis’ SS19 show was a perfect mix of glam and destruction. Both men and women, although dressed without indication of any gender, showed influence of pop culture, 90’s glam, and 70’s punk. Solis set no boundaries for himself, displaying a show full of emotion, rebellion and angst.